certified and experts in the art of fun and learning. 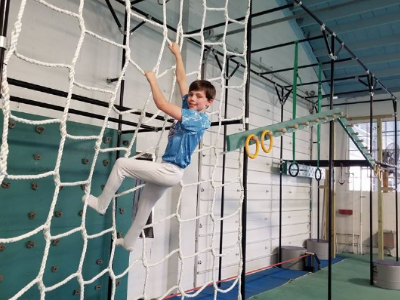 The Hocking Valley GymNinja Program offers four different fun and exciting opportunities. Professional Instruction in GymNinja Obstacle Training, Gymnastics Skills, Strength and Fitness. New GymNijna obstacle courses every week. Special events scheduled semi-regularly with pre-registration. GymNinja challenge courses raced for time. Weekly open gym time for GymNinja play and practice. New courses set up each week. Private groups with the run of the gym. Professional party instructors guide and supervise the fun. Birthdays, field trips, group outings, team building, special events. Activities tailored to the group. It is our mission to provide youth with high quality training in a positive and family-friendly environment. The purpose of this training is to enable our students to be the very best they can be at their chosen discipline and in all aspects of their lives. Positive personal character development and sportsmanship are just as important to us as competitive success. We believe that the pursuit of excellence in sport, coupled with a positive character development, will develop self-discipline and promote positive self-esteem while preparing our students for excellence in all aspects of their lives and give them skills to positively impact the world.